Getting out of London but can not live without you afternoon tea? Don't worry, if you are going to the Middle East, you are not going to be disappointed. In addition to enjoying this fine English tradition, this indulgence allows you to enjoy the splendor, décor and hospitality of some of the best hotels in the world. It is perhaps fitting that, in one of the world’s richest cities, the dazzling Emirates Palace Hotel includes 24 karat gold leaf adornment to its cappuccino and chocolate fondant, both of which feature on their afternoon tea menu. Indeed a staggering 5kg of edible gold is estimated to be used, per year, in food decoration, at Kempinski’s Emirates Palace Hotel. Afternoon Tea is taken at Le Café, in the lobby of the hotel. This is of course no ordinary lobby, but one where you will be serenaded by the harp or piano and be dazzled with Swarovski’s Strauss crystal chandeliers. You don’t have to hire a Chauffeur driven Rolls Royce to transport you to the Burj Al Arab, but it certainly does take the experience to an indulgent level. Reservations are essential as entry to this iconic hotel is strictly limited to residential and dining guests (remember to print out and take with you your reservation confirmation). Deciding on which hand dipped chocolate will be the perfect accompaniment to finish your sumptuous tea, will not be your only decision at Dubai’s 7 star hotel as there are in fact two venues to choose from. Sahn Eddar is situated on the mezzanine level allowing guests to appreciate the splendor of the world’s tallest atrium and impressive 32ft fountain jet. 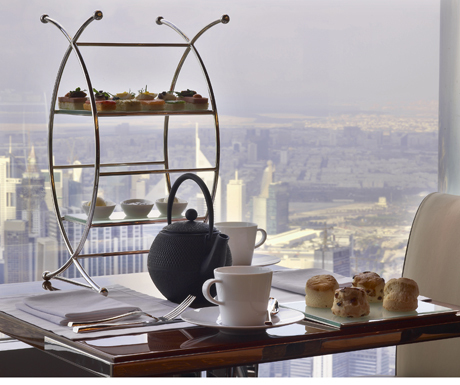 Those over 21, have the option of Afternoon Tea in the Balcony Bar, adding stunning views over Dubai, and the option of a glass of champagne to your decadent high tea. After a £20 million renovation Pera Palace Hotel has regained the charm that attracted King Edward VIII, Greta Garbo Alfred Hitchcock, Agatha Christie and Hemmingway as guests here. The sumptuous Afternoon Tea is served by waitresses in pristine uniforms to a buffet banquet allowing guests to refill their plates as often as their waistbands will allow. Bringing a whole new meaning to “High Tea’ At.Mosphere serves Afternoon Tea on the 122nd floor (442 metres/ 1,350ft up), of the world’s tallest building, the Burj Khalifa. A harpist serenades guests as they take in the stunning views and enjoy the delectable food. To enjoy at its best try to book mid-week away from the crowds. Valet parking is a lovely gesture as you arrive at Le Vendôme. In addition to traditional Afternoon Tea, Sydney’s Club also boasts an extensive cigar and whisky menu, quite suited to its décor of Paisley rugs and deep leather sofas. Yet, in contrast, Afternoon Tea is perhaps best served in the café style area of Sydney’s where panoramic views from the floor to ceiling glass windows allow you to soak up the Mediterranean vista. Do check dress attire as shorts sandals and collarless shirts are not normally acceptable in hotel lounges. Hours may vary during the holy month of Ramadan.